Like many of my friends in CLMOOC, I still remain fairly uncomfortable with the terminology of “remediation” in terms of explaining these rhetorical moves across platforms and mediums (as opposed to its traditional meaning of remediation, as a descriptor of someone who needs extra help because they lack skills or knowledge or understanding). I am trying to find some balance for the word even as I work with the concept. 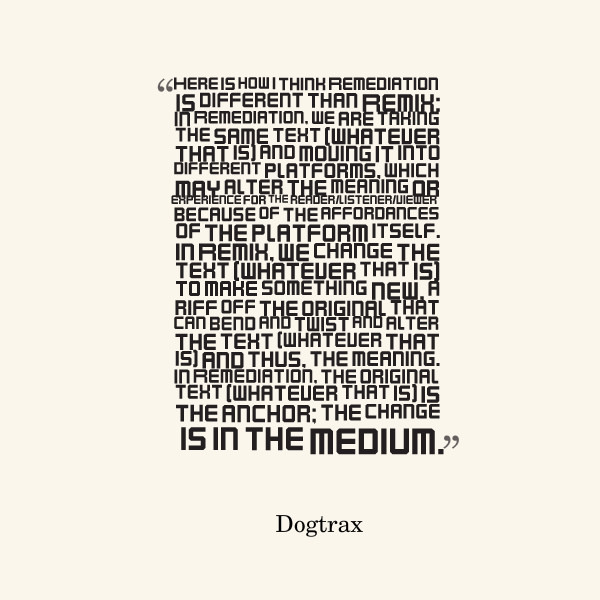 I think the pushback on terminology is good and healthy, and skepticism about what we are talking about when we talk about digital literacies is necessary. 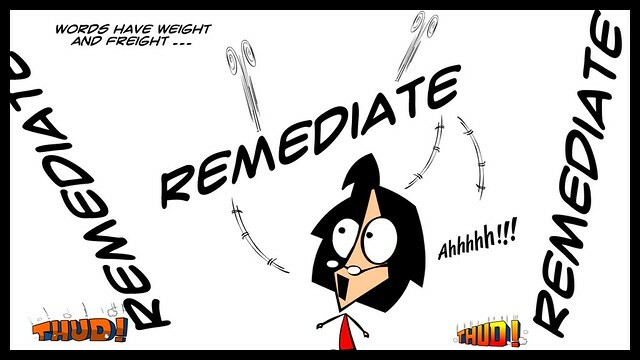 For me, the call to “remediate” was really an invitation to jump through mediums, an adventure I am always game for. I’m not sure I will be using that term in the future, though. 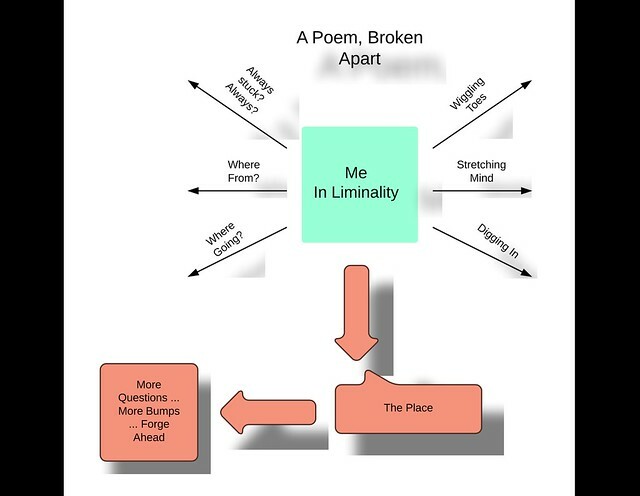 This is my final “reMEDIAtion” of the poem I have been using, bringing it into a flowchart format to see if it would still make sense. It is no longer much of a poem, but the message still seems to stand firm, even in this medium. 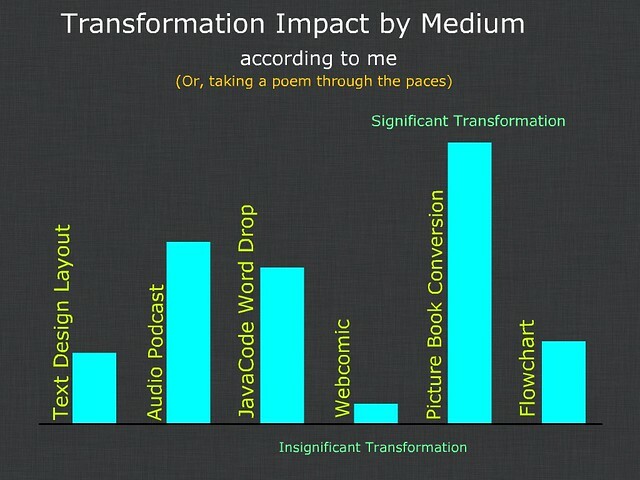 Finally, I went back again to see what I had been doing and I decided to create this very unscientific, completely unreliable personal graph to gauge my own view of whether various mediums “transformed” the poem in any significant way. You can see that some worked better than others, in my opinion. But each one was worth the time and effort. The only downside? I am pretty tired of the poem and ready to put it on its last medium: the archived shelf.